The next chapter for baseball's controversial, gamblin' record breaker is a restaurant on the Strip. 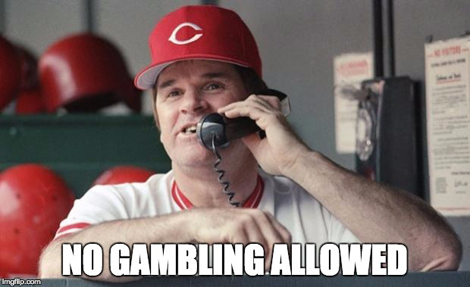 Pete Rose may never get into the Baseball Hall of Fame due to his gambling ways, but will he get into the culinary hall of fame? It’s actually a possibility now, given that baseball’s all-time hits leader is launching his own restaurant in (where else but) Las Vegas. That’s right, the Pete Rose Bar & Grill is set to open on the Vegas strip in mid-October. And in a twist that nobody saw coming, there will be no gambling allowed on the premises (perhaps because Rose allegedly doesn’t gamble any more?). That kind of seems like A-Rod opening a gym in South Beach and posting a “No PEDS Allowed” sign. But, we digress. Though the full menu has yet to be released, Rose has said that several items will be nods to teams he once played for, including Cincinnati Chili (the Reds), a Philly Cheese Steak (the Phillies), and Poutine (the no-longer-in-existence Montreal Expos). Named for the man whose all-time hit record Rose famously broke, this mainstay is served with a side of Demerol and piled high with racial epithets. Plus, in true Cobb fashion, diners get a complimentary beating with every order. This house favorite is made with prime grass-fed sirloin OR bottle caps and cigarette butts, depending on how the week’s wagers shake out. Topped with diced horse racing forms and shaved points, don’t bet on this treat being anything but delicious. Also, don’t bet on the team you play for and/or manage. Just saying. Did you know that the baseball commissioner who banned Rose for life was Paul Giamatti’s dad? It’s true: A. Bartlett Giamatti. And why is this dish named Giamatti Pie? …Umm. No reason. The next time you’re in Sin City, be sure to stop by the Pete Rose Bar & Grill. Just make sure you pay your bill in a timely manner so as to not have both thumbs broken. House rules!